Congratulations to "Roxie J." and "Jonetta A. ", the winners in Lena's giveaway. Thank you to all who participated! I get that question a lot, especially from people who find the idea of meeting a writer fascinating. And why wouldn’t they? Writers are the true superstars of entertainment, LOL. For me, writing romantic suspense isn’t just about detectives or FBI investigators taking down the bad guys. At least, not in my romantic suspenses. In my stories, sometimes the good guys turn bad and the bad guys are created. 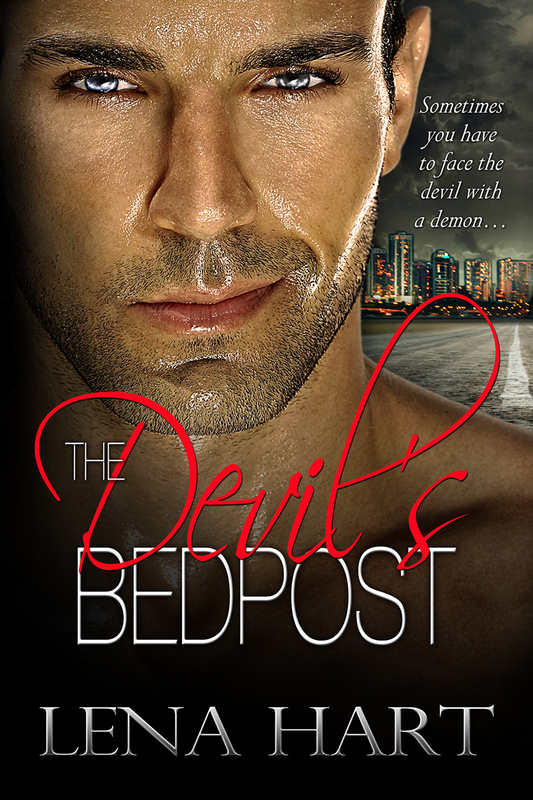 In my upcoming release, THE DEVIL’S BEDPOST, that’s exactly what happens and revenge is at the heart of their fall. It’s the need for revenge that drives the “heroes” in the story down a destructive path until they ultimately lose themselves—all for the women they loved and lost. 1. Amnesia: the character doesn’t know how they got where they are but needs to fit into a new identity for their protection. 2. Disguise: character pretends to be someone they aren’t, falls in love yet forced to continue the ruse to either finish a job or protect themselves or their lover. 3. Enemies-to-lovers: what starts off as rivalry, i.e. business competitors, family feuds, law enforcement/criminals, eventually leads to lust and/or love. 4. Kidnapped: character is abducted by villain and later rescued—or realizes they have romantic feelings towards their kidnapper. 5. Mistaken identity: character is assumed to be someone else and perpetuates the misunderstanding for their or someone else’s safety. 6. Protector/Bodyguard: one character is determined, or hired, to protect the other from physical harm from stalker, sociopath, or the public. 7. Revenge: character is determined to get revenge from the lover or an acquaintance for a real or imagined past wrong. Who wouldn’t love a good revenge story? Revenge is a powerful instrument that can make good men dangerous and I loved playing with this story device in THE DEVIL’S BEDPOST. Not only does it make for great storytelling in romantic suspense, it reminds me that we’re capable of doing anything for the ones we love. But the above list is nowhere near exhaustive. Within the subgenre, romantic suspense has a variety of tropes that will continue to keep readers on the edge of their seat and turning the page ‘til 2 AM. So…which romantic suspense trope would you kill to read? Good looks. Thriving business. Beautiful fiancée. 2 lucky winners leaving a comment or email entry will receive a free e-copy of HIS BEDPOST QUEEN. Lena Hart is a multi-published author of contemporary, historicals, and romantic suspense. She is known for weaving tales of incredible love with unforgettable passion. When she’s not busy writing, you can find her reading, researching, or conferring with her muse. To learn more about Lena and her work, visit www.LenaHartSite.com. Giveaway ends 11:59pm EST July 21st. Please supply your email in the post. You may use spaces or full text for security. (ex. jsmith at gmail dot com) If you do not wish to supply your email, or have trouble posting, please email maureen@justromanticsuspense.com with a subject title of JRS GIVEAWAY to be entered in the current giveaway. I like enemies to lovers and revenge. Enemies to lovers and the bodyguard/protector are two of my fav tropes. Bodyguard/Protector is my favorite because it's the best one where they truly get to know each other well. Love romantic suspense. It's best of both worlds with the strong protector who is charming and loveable. Love finding new me to authors and their books! This one looks awesome, romantic suspense is my favorite. All exciting themes. Make for great reading.